You’ll never guess what I did this morning. It’s not a challenge or anything, if you know me at all you will literally never guess. At 7.35am, when Belle left for school, I left with her (a miracle in itself as I am normally still in bed) and went for a jog. I say jog – it was day one of the couch to 5K programme, so was a minute of jogging then a minute and a half of brisk (although probably not as brisk as it should have been) walking, for a total of twenty minutes. The runners among you may scoff, but for me this is a big deal, and it’s only now, a couple of hours later, that my face is returning to a vaguely normal colour. So pleased with myself was I in fact that I very nearly did something rash like add ‘run a marathon’ to my 40 things before 40 list, but I saw sense just in time and figured I should probably pace myself. The truth is thought that something had to be done. In your twenties you might be able to get away with the whole ‘let them eat cake’ attitude, but I am 35 now and a lifetime of generally sitting about watching TV and eating said cake has left me not a little on the chubby side and decidedly unfit. It’s not OK any more. September might seem like a funny time to take action, but the back-to-school vibe can be quite inspiring and apparently nearly half of mums see it as as opportunity for a fresh start for the whole family. 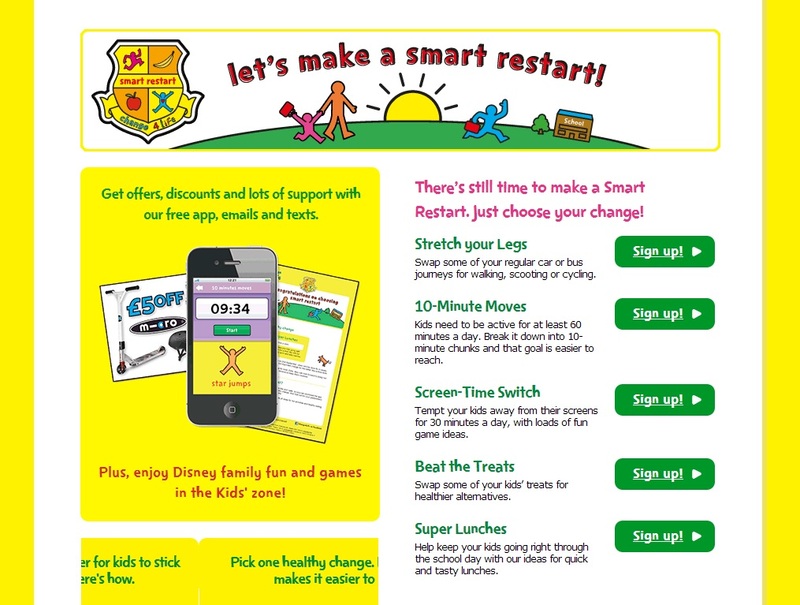 To capitalise on my temporary enthusiasm, I have signed up to the new Change4Life back-to-school campaign – Smart Restart. The idea behind Change4Life is a simple one – eat well, move more, live longer. It’s not rocket science, but then actually getting fit and keeping healthy isn’t complicated. The campaign encourages participants to make small steps, picking just one change that they want to make, whether it be spending less time in front of the TV or putting together a healthier packed lunch. I admit to having a bit of a tendency to parking Belle in front of the television or iPad while I work, and so I chose the ‘Screen-Time Switch’ challenge. You can choose how often you want to tempt your child away from the television (I went for three times a week) and then you just sign up. I opted in to the emails and texts so as to get regular encouragement and tips. 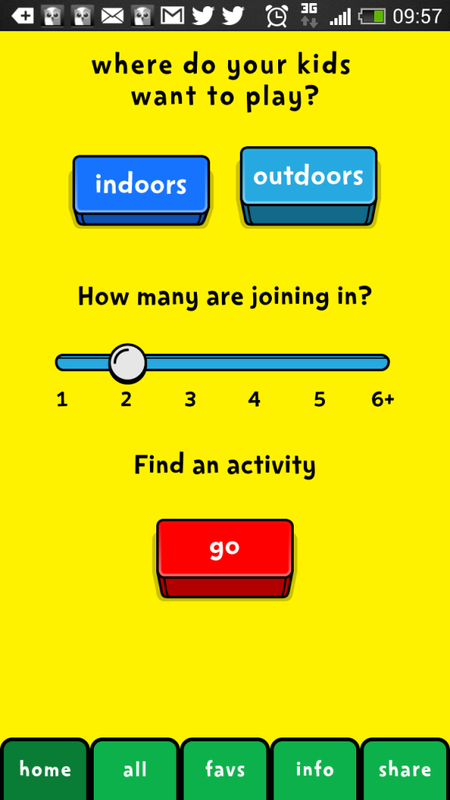 There’s also the option to sign your kids up too so that they can access their own activities and games on the site. As my challenge was to tempt Belle away from screens I decided to pass on this step! You then have the choice of following the programme through the website or through the free Smart Restart app, (available on iEverything and Android). I am an app girl myself, so went for that. Then you just have to make the change! Every week you have tasks to complete and can track your progress easily to see the difference you are making. 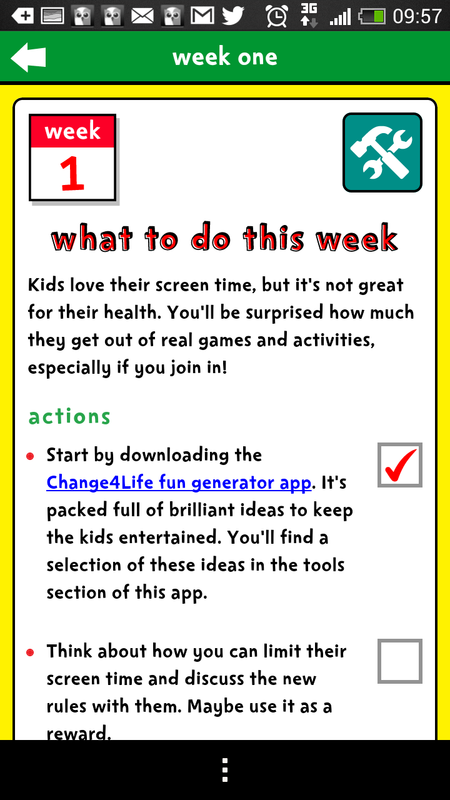 As part of my challenge, I was prompted to download the ‘fun generator’ app, to give Belle and I ideas for alternatives to watching TV.